The Inventory Stela is routinely described as a pious fraud, a document created for the small Temple of Isis on the Giza Plateau around 670 BCE to support the claim of the temple priests for a greater antiquity for their temple than the Pyramids and the Sphinx. The text takes the form of an inventory of statues in the possession of the temple, among which are references to the Sphinx and the Pyramids. Fringe historians, including both Graham Hancock and Robert Bauval, have cited this late text as proof of varying claims, including the Sphinx predating the Pyramids, Osiris being worshiped from the first in the Valley Temple of the Sphinx, etc. Hancock and Bauval both accuse Egyptologists of fraud and suppression for not crediting this late text as a genuine survival of archaic facts. 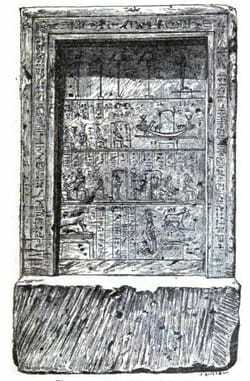 The translation and commentary below are those of James Henry Breasted, who described and discussed the stela in sections 177 to 180 of his Ancient Records of Egypt​ in 1906. ​Discovered by Mariette during his excavations of the Sphinx and vicinity (September, 1853, to 1858), in the little temple of Isis built by Pesebkhenno, east of the great pyramid; now in Cairo. Text: Mariette, Album, PI. 27; Monuments divers, 53; Maspero, Dawn of Civilisation, 413; Rougé, Recherches sur les monuments qu’on peut attribuer aux VI premières dynasties, 46; Birch, Egyptian Texts, 5, 6; Bunsen, Egypt’s Place, 2d ed., V, 719-21. See also Mariette, Le Sérapéum de Memphis, 90, 100; Meyer, Geschichte des alten Aegyptens, 207, 208; and Brugsch, Thesaurus, V, 1231. 179. The inscription in the lowermost section of the sunken panel is also of importance in conjunction with § 180. — may he grow; may he live forever and ever, ˹looking˺ toward the east. ​ Maspero, Dawn of Civilisation, 364, n. 8. Top and left side; introduction same as top and right side (§ 180). Text has the three nw signs used in writing Nun. Of her titles to the land? It is probably this remark which led Maspero to conclude that this stela is a copy of an older document. The word translated “investigation” (sp˙t for s˙yp˙t) occurs also in Dümichen, Bauurkunde des Denderatempels, 16, in the same connection; cf. Brugsch, Hieroglyphisch-demotisches Wörterbuch, 1206, and a better example in Brugsch, Thesaurus, V, 1223, top line (time of Ramses II). A reference to the statues of the gods enumerated in the sunken panel. The stela is really an inventory of such statues; see § 180. The connection between this sentence and the preceding is probably that the limits of “The district of the Sphinx” were investigated as found recorded in “the writings (viz., the records) of the goddess.” (It is possibly this statement also which leads Maspero to believe the document is a copy of an older one.) The same word (syp) is used in reference to the investigation of old titles, e. g., in Khnumhotep’s tomb, Benihasan (§ 625, 1. 44.). This is also her title in the sunken panel. The genitive n shows that “Harmakhis” as found in the same phrase in the sunken panel, has been omitted. According to Herodotus, the middle of the three small pyramids east of the Great Pyramid, belonged to Khufu’s daughter (Herodotus, II, 126). Henutsen is mentioned in a contemporary tomb at Gizeh (Brugsch, Thesaurus, V, 1231). According to this statement, the little Isis-temple east of the Great Pyramid was standing on the Gizeh plateau before any of the pyramids were built! If Maspero accepts this statement, he should add this Isis-temple to the buildings which he believes were the predecessors of the pyramids on the Gizeh plateau (Maspero, Dawn of Civilisation, 365, n. 2). Source: James Henry Breasted, Ancient Records of Egypt, vol. 1 (Chicago: University of Chicago Press, 1906), 83-85.